While we gave up red meat some years ago, we definitely weren't willing to forgo the many dishes we so love that often star this main ingredient...like burgers, meatballs, tacos, and CHILI! So we've simply reinvented our favorites along the way. 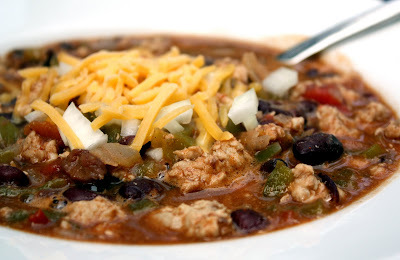 This particular Turkey Chili is one that we avidly look forward to this time of year when temperatures begin to fall like the leaves on our trees and all we want is a dish that's comforting and satisfying. Chili is like hamburgers, hotdogs and apple pie...a classic. Yet it truly doesn't have to have beef in it to be delicious. Besides all that, this season favorite allows me to finally pull out my beautiful red-orange Le Creuset dutch oven (which I secretly pined for and received a few years ago). Its cheery color and heavy presence almost guarantee to deliver a soothing goodness regardless of what's dropped in. The key to the success of this chili is in the seasoning. Turkey is a lean meat but also relatively bland. Giving it a little punch before you get too far along in the process is important. And, adding a good mix of seasonings as it simmers assures that you'll bring its flavor up to (and, perhaps, beyond) its beef brethren. Topped with a good shredded cheddar cheese and some diced onion, it holds its weight with the best of "chilis." 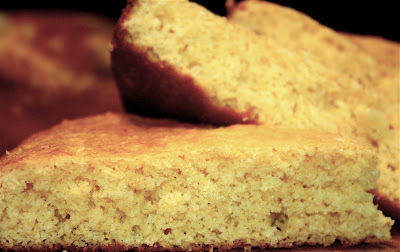 And, of course, a little hot-out-of-the-oven cornbread with a pat of melting better atop doesn't hurt either. 1. Heat 2 tablespoons olive oil in large dutch oven, or heavy pot, over medium heat. Add 1 cup of the diced onions (reserving remainder for topping), garlic and bell pepper. Saute until onions are just slightly translucent...basically just "sweating" the vegetable mixture. Move mixture to side of pot and add 2 tablespoons olive oil to cleared half of pot (or pull veggie mix out for a bit while you start your turkey). Add ground turkey to oil and break up and cook apart from veggie mixture for about 1-2 minutes before incorporating all of veggies into the turkey. Add 1 to 2 tablespoons of chili powder, 1 teaspoon salt, 1/2 teaspoon black pepper, and paprika to meat mixture to season. Mix well and continue cooking until meat is just cooked through. Taste for seasoning and adjust as needed. 2. Add diced tomatoes, water, beans, chilies, and remaining seasonings to pot (taste before adding salt as canned juices from beans may add additional saltiness). Stir well and reduce heat to medium low. Let simmer for approximately 20-25 minutes to heat through and meld flavors. Add additional chili powder, salt and/or pepper to taste. Serve with freshly shredded cheese and diced onions.